I Love Arnside & Silverdale: Its just another Polystichum Aculeatum! 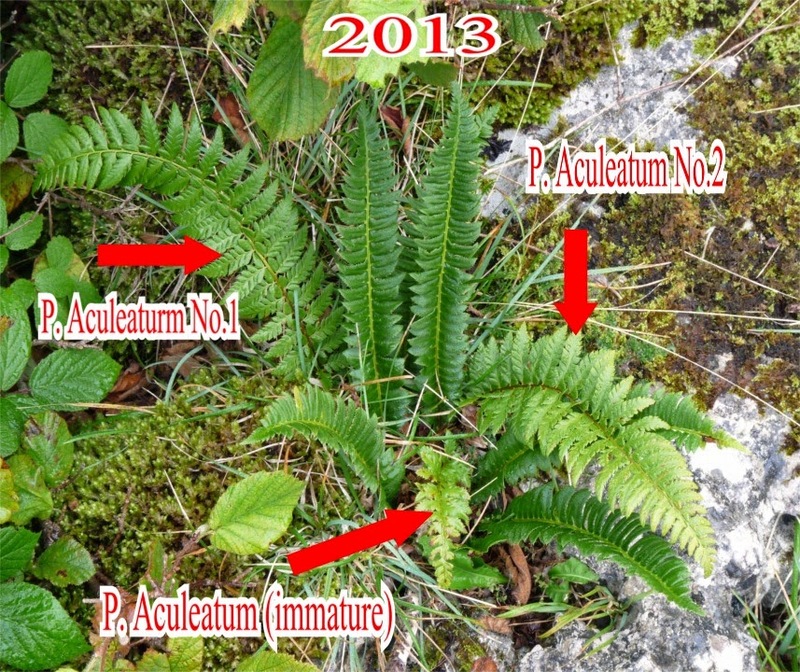 The Top photo shows what the position was like in 2013 showing a small immature fern to the front of the plant. Lots of us were getting rather excited! why! Well although we know we have got something really really special with the fabulous Holly Fern (Polystichum lonchitis), some of us also thought that we may have also had the lonchitis hybrid simply known as Polystichum x illyricum. Its has already been recorded from two areas in Scotland and also within Ireland, but as yet there have been no records ever for England. So would'nt it be nice to have the rare hybrid. Well I guess for now we will just have to "keep on searchin"
Wow, these rarities! found some more of the rare Southern Polypody (Polypodium cambricum) today and this time its within a new tetrad. Also someone else has found some more Ceterach. 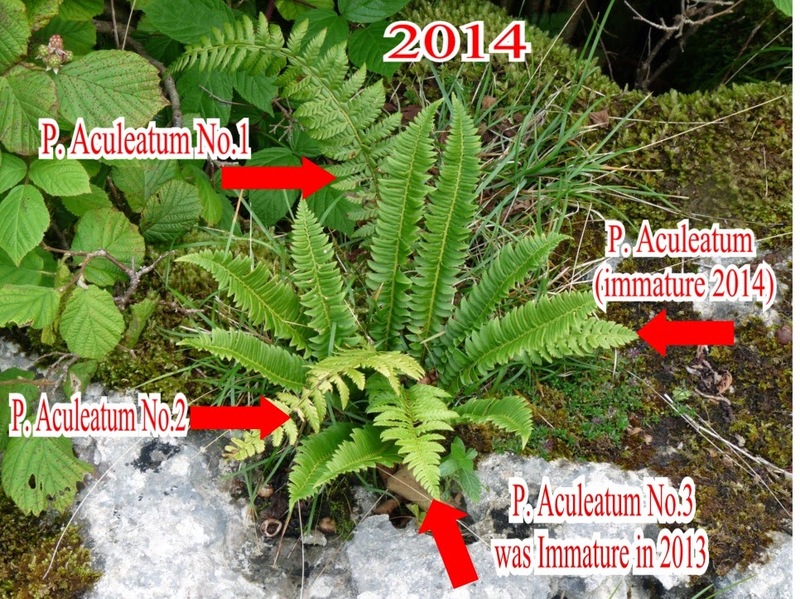 Well I checked out one of our old (long established) Black Spleenwort (Asplenium adiantum nigrum) sites on Saturday and again today just to make sure, we have always had a good growth of the fern whilst sharing 50% of its territory and alongside the Brittle Bladder Fern (Cystopteris fragilis), and guess what? its gone, completely disappeared, the Brittle Bladder Fern (Cystopteris fragilis) has taken over completely. Not to worry still got several Black Spleenwort (Asplenium adiantum nigrum) sites to go at, In fact I was also lucky enough to find yet another plant today which was growing at the ridiculous position of 2 metres down the side of a gryke. There's one thing for sure, no beast will try and eat that one. 13th August 2014 Had a single Swift heading South, somewhere near the River Bela by the Wings School which lies between Holme and Milnthorpe, Cumbria. 15th August 2014 At least one Chiffchaff with broken song, and lots (10+) of Willow Warblers giving off their "houwit" contact call were collective on Vicarage Lane, Burton In Kendal, quite close to the "Grim Reaper" natural wood statue and close to the Dalton hamlet side. Presumed resting up whilst on passage. Immediate local area not usually associated with these species during breeding season. 21st August 2014 Just found out that the Spotted Flycatchers have again bred within Dalton Park and were seen with young. SPOTTED FLYCATCHERS ON THE MOVE: In both 2011 and again on the same day in 2012 large parties (up to 12 or more), of Spotted Flycatchers were seen flitting about within the trees and will have been resting or feeding up whilst on migration passage, were seen in 2011 in Dalton Crags near to where the charcoal burners were, and again on the same Lat/Long line in 2012 but further across to the BAP Memorial Seat on Lancelot Clark Storth, coincidence or what but the magic date was August 24th. Missed checking it out last year (2013). 24th August 2014 Arthur and Linda P had a Wall Brown Butterfly over on the Farleton side by Newbiggin Crag.